The Revital Fertiliser Premier Two Day competition was completed with a three day final over the weekend. 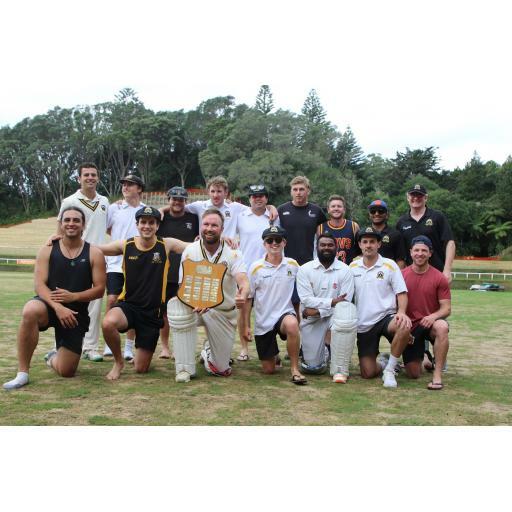 Top seeds Inglewood went head to head with New Plymouth Old Boys at Pukekura Park. Inglewood won the toss and elected to bowl first on a hard and green Pukekura Park wicket. The Inglewood seamers had immediate success as NPOB soon found themselves in trouble at 11 for 3. Opener Jackson Braddock-Pajo held firm as he combined with Davis Mills for a 64 run partnership which started to swing the momentum NPOB way, when Braddock-Pajo was dismissed for 45 Mills was joined by NPOB skipper Mattie Thomas, these two capitalised on the momentum shift as they put on 109 for the 5th wicket, Mills would evenutally depart for a well compiled 73, Thomas was next to go for 65. NPOB lower order Tem Hodson, Jamie Watkins and Ross Bryans would all make 20 plus as the final four NPOB wickets would put on 98 runs as NPOB were dismissed for 296. Jason Dombroski was the pick of the Inglewood bowlers taking 5 for 72 off 21.4 overs. The Inglewood openers looked comfortably as they survived 18 overs before stumps on day one finishing 35 without loss. Day two was a different story as NPOB picked up three quick wickets inside the first half hour of play to leave Inglewood at 59 for 3. Luke Dravtizki would battle away to make 44 but had very little support from any one else as the Inglewood batsman struggled against the consistency of the NPOB bowlers. Inglewood was finally dismissed for 172 giving NPOB a 124 run lead on 1st innings. Mattie Thomas completed 18 overs for figures of 4 for 22. Dombroski would pick up NPOB opener Ben Mitchell early to give Inglewood a glimmer of hope, that hope was soon lost as Braddock–Pajo and Josh Borrell combined for an 86 run stand, Braddock–Pajo was dismissed for 53 five minutes before stumps which saw NPOB end the day at 97 for 2 and a lead of 221. Going into the third and final day Inglewood was in need of a miracle as NPOB looked to safely bat through the 105 overs in the days play to win yet another two day title. Borrell was dismissed for 48, Hodson would make a valuable 68 and when he was the 5th wicket down for 203 NPOB looked safe. However with 60 overs left in the day Martin Keegan who picked up Hodson would strike a further two times and Dombroski would pick up one all in the space of four overs as NPOB found themselves 221 for 8, with the Inglewood on the charge, Ross Bryans and Dean Stewart dispelled any panic that had crept into the NPOB camp as they successfully saw out 27 overs and 108 runs later finally brung the Inglewood side to their knees as the concession came at the tea break. Stewart finished 54 not out and Bryans completed what has been a fine club season with 58 not out. NPOB triumphant adding the two day title to the one day title won earlier in the season.